Perched on a cliff overlooking the Mediterranean Sea, the Hilton Tel Aviv hotel is 1 minute from the beach. Relax by the outdoor pool or be pampered at the spa. Dine on sushi at Yakimono Sushi Bar or Mediterranean dishes at King Solomon. Relax with a cocktail at the Lobby Lounge. The Hilton Tel Aviv hotel has 14 meeting rooms for 6-1500, a business centre, Executive Lounge and Business Lounge. All guest rooms and public areas have wireless internet access. Between meetings, take in sea views from the 17th-floor Executive Lounge. De-stress with a workout or massage at the Cybex Spa. Swim in the onsite saltwater pool or at the beach 1 minute's walk away, where you can also watch the yachts come and go at the Marina. Shop till you drop at Dizengoff Center or explore Old Jaffa. All rooms, from Hilton Guest Rooms to Suites, have wireless internet access and private balconies. Most have sea views. Hilton Guest Room - Welcome to this traditional 32mÂ²2/344sq.ft room with a sea view, balcony, work area and marble bathroom with large bathtub. Catch up on work at the desk or check your emails with wireless internet access. Hilton Business Room - Work is easy in this 32mÂ²/344sq.ft room with stunning sea views. Get to work at the desk with wireless internet or relax watching movies on the 21-inch TV. Enjoy Hhonors Business Lounge access offering snacks and refreshments. Do check-out our premium Executive Rooms, offering sea views and the 17th floor Executive Lounge access. Junior Suite - Enjoy a home from home in this traditional 45mÂ²/484sq.ft suite with a sea view, balcony, working area and a seating area with sofa. Catch up on work at the desk or keep in touch with wireless internet access. Some rooms have a city view. Special touches include a fluffy bathrobe. Suite - Spoil yourself in a traditional 44mÂ²/473sq.ft suite with a city or sea view, balcony and working area. Check your emails with wireless internet. Some suites have seating area, living room, 2nd bathroom or a Jacuzzi. The Queen Plaza Exec Suite has Executive Lounge access with free breakfast and refreshments. Executive Room - Business is a pleasure in the Hilton Tel Aviv hotel's traditional 32mÂ²/344sq.ft room offering sea views from the private balcony. Get to work at the desk and surf the web with wireless internet access. For additional space, upgrade to a 44mÂ²/473sq.ft Executive Plus room with sea or city views, an easy chair and work area. All Executive Level guests enjoy exclusive access to our roof-top Executive Lounge on the 17th floor, which overlooks the Mediterranean. The Executive Lounge serves a complimentary breakfast, snacks, alcoholic, soft and hot beverages throughout the day and a light supper. Also available are foreign and local newspapers, magazines and a flat screen TV - all free of charge. From Ben Gurion International Airport, take Highway 1 west towards Tel Aviv. Take the Arlozorov Street exit, turn right and continue all the way west to the Hilton Tel Aviv hotel. The journey takes 20-45 minutes depending on traffic. Directions: From Ben Gurion International Airport, take Highway 1 west towards Tel Aviv. Take the Arlozorov Street exit, turn right and continue all the way west to the Hilton Tel Aviv hotel. The journey takes 20-45 minutes depending on traffic. Come to this modern Tel Aviv restaurant for sophisticated Mediterranean dining. Sip a glass of Barkan wine and savor baked grouper with Mediterranean vegetables or roasted pepper-crusted beef fillet. A melted chocolate soufflÃ© provides the perfect end to an evening at the Hilton Tel Aviv hotel. For a taste of Tokyo, try the Japanese specialties at the Yakimono Sushi Bar in the Hilton Tel Aviv hotel. Savor authentic soups and salads, sushi and sashimi, such as Muguro (red tuna) and Kurodai (sea bream), accompanied by sake, green tea or Japanese beer at this Tel Aviv restaurant. 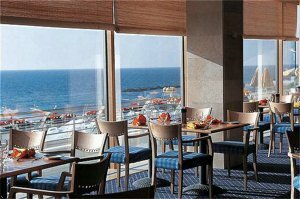 Start your day at the Hilton Tel Aviv hotel with magnificent views of the Mediterranean Sea. Enjoy a freshly squeezed orange juice and a buffet breakfast of fine cheeses, fresh vegetables and hot dishes. This informal Tel Aviv restaurant also offers buffet dining on Friday evening and Saturday lunchtime. Join fellow guests and locals at this stylish Tel Aviv bar for a quick coffee, business lunch or pre-dinner drinks. Relax on a sofa and enjoy the live piano music at the Hilton Tel Aviv hotel. Sip a cocktail and snack on a plate of smoked salmon or indulge in a coffee tiramisu. In spring and summer, the Hilton Tel Aviv hotel's Pool Bar is the perfect spot to enjoy an alfresco lunch with views of the Mediterranean Sea. Choose a grilled chicken kebab, salad or Mediterranean Plate. Cool off with a glass of Israeli wine or local Goldstar beer at this Tel Aviv restaurant. Hilton Meetings room in permanent boardroom setup. Polished wood boardroom table and Hilton 8 hour executive leather chairs. Natural daylight. Video conferencing facilities. Hilton Meetings room on permanent boardroom setup.Polished wood boardroom table and Hilton 8 hour executive leather chairs Natural daylight. Video conferencing facilities. Hilton Meetings room in permanent boardroom setup.Polished wood boardroom table and Hilton 8 hour executive leather chairs. Natural daylight. Video conferencing facilities. Oblong shaped room which is used on a regular basis as a Synagogue. Nicely located and decorated oblong shape room. The area that is used for all receptions and buffets. It overlooks the swimming pool. The Grand Ballroom and Foyer overlook the Mediterranean sea. Sober and elegantly decorated with an atmosphere of refined elegance. A charming garden terrace is available for outdoor events in summer. The ballroom can be divided into 3 sections. Suitable for family ocasions or business seminars and exhibitions.